Are you looking for children’s dentistry in Pasadena, TX? At Pasadena Dentistry, gently caring for children’s smiles is one of the things we do best! Dr. Holmes, Dr. Revel and Dr. Lowry help both kids and their parents feel at ease by delivering safe and soothing dental care. Children’s dentistry from our fun, enthusiastic, and knowledgeable team will protect your child’s smile now and in the future. We like to see kids for a first dental visit around age five or even sooner if you notice problems. The American Academy of Pediatric Dentistry (AAPD) and the American Dental Association (ADA) both support the concept of a establishing a “dental home” where children receive regular and comprehensive oral health care. With expertise in all aspects of children’s dentistry in Pasadena, TX, Dr. Holmes, Dr. Revel, and Dr. Lowry invite you to make Pasadena Family Dentistry your child’s dental home. The dentists perform thorough yet gentle exams to check for decay, to ensure correct bite alignment, and to assess appropriate dental development. Regular dental cleanings will start your child on a lifetime of good dental health. To prevent tooth decay, the dentists often recommend dental sealants or a fluoride supplement. These easy-to-apply treatments are proven cavity fighters, and they are a good way to safeguard your child’s smile. We provide a positive experience to help kids achieve strong smiles and an appreciation of good oral health. 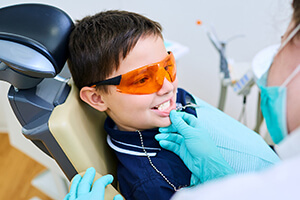 Finding the best children’s dentistry in Pasadena, TX for your child is crucial, as the health of your child’s primary or baby teeth will impact the health of their permanent teeth. A child’s primary teeth support proper chewing and eating, provide space for the permanent teeth to guide them into the correct position, and promote normal development of the jaw bones and muscles. There are certain areas of the mouth that are harder to keep clean than others, especially the chewing surfaces of the far-back molars and premolars. Children who are still learning to brush and floss are particularly susceptible to decay in these areas, which is why our doctors are likely to recommend dental sealants as a simple and effective preventive service. Sealants are designed to “seal” over these deep pits and grooves, blocking out food particles and harmful bacteria that like to gather there over time. Fluoride is a mineral that’s commonly added to community water supplies – and for good reason! Countless studies have shown that patients who grow up with regular exposure to fluoride tend to have teeth that are stronger and less prone to cavities as a result. 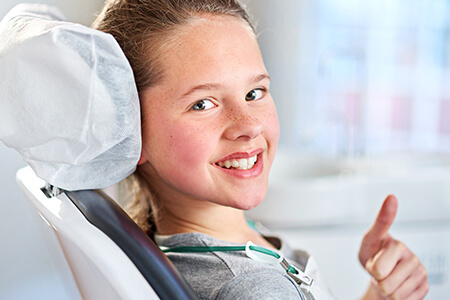 If your son or daughter’s special smile could benefit from more fluoride, our team offers professional applications that can help their teeth stay strong and cavity-free.